1. April is over, already? It seems as if it only just arrived. And here comes May, wow! 2. The pool is open, bring on the 80 degree temperatures. 3. If I lived in Florida or south Texas, I wouldn't have to spend a whole day opening my pool. Anyone want to offer me a fairly good paying job in South Florida? 4. Families with members in very different places in their lives create natural tension. 5. Cats are wild cards. They do what they want. 6. The O's are in a tie for first place in the AL East with Tampa--and the best part is that they have a 1.5 game lead over the Yankees who they play tonight. O's fans may finally have a team to believe in. 7. Chili is a fun food and chili competitions bring out the best in cooks. 8. Vacation planning is constant it seems. I just returned from one and am already planning my next. In reflecting on the logistics of my recent vacation, I realized that in there were a couple of people who, behind the scenes, worked really hard to make the experience a success--and they didn't even get to enjoy the "land the mouse built" in person. So P&T -- thanks for getting up at 4:30 AM to drag us to the airport and watching the animals while we were away. I know Makayla appreciated the mini-vacation. And thank-you too for being there when we finally wandered back into the airport and dragging us home. I know sometimes that I especially forget to thank the behind the scenes people who work hard and make things successful. The color of Spring. The color of life. I really noticed how the leaves have filled out on the trees the other day as I was driving home from work and it seemed that the highway was nothing more than a trail leading into the forest. Green is peaceful and provides the perfect counterpoint to the color of the sky. It also provides a great background for flowers. 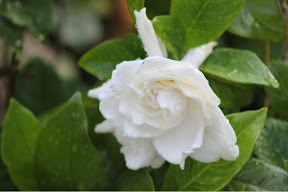 Like this gardenia I happened across while in Orlando last week. I look out my window now and see full green trees and bushes. I live in seclusion now--apart from the world, protected by the screening of the leaves of green. Bring on the green and let the outdoor living begin. In Maryland police take DNA from accused suspects--who are not convicted without probable cause--and do not see that as wrong. The article Maryland Law Enforcement Agencies Still Taking DNA Samples, as reported in the Baltimore Sun, details the latest insidious assault upon our Fourth Amendment right to protection from unreasonable searchand seizure. 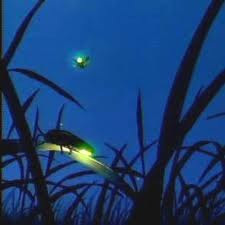 I have copied the Fourth Amendment here: The right of the people to be secure in their persons, houses, papers, and effects, against unreasonable searches and seizures, shall not be violated, and no warrants shall issue, but upon probable cause, supported by oath or affirmation, and particularly describing the place to be searched, and the persons or things to be seized. The court told them to stop--and they haven't. I read an editorial, Court of Appeals vs CSI which thinks the practice is a justified expedient because they are solving other crimes by violating Fourth Amendment protections against unreasonable search and seizure. 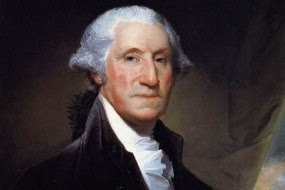 Although the end (convicting perpetrators of crimes) seems to justify the means, it is still a violation of our rights. The author writes, For starters, the majority opinion conflates the presumption of innocence afforded to a defendant prior to conviction with his expectation of privacy. Judges Mary Ellen Barbera and Alan M. Wilner correctly note in their dissent that arrestees' expectations of privacy are diminished in far more intrusive ways than the collection of DNA by means of a cotton swab rubbed for a few seconds inside their cheeks. They are subject to thorough searches of their bodies and possessions (including strip searches, an intrusion the Supreme Court recently blessed), and are observed in states of undress by police and fellow detainees while in jail. But collection of DNA is an intrusion and a means to collect evidence without probable cause to be used against people--to convict them. The line between authorized intrusion for safety and security and intrusion with the intent to collect evidence may be a fine one--but it is a line that must be protected. Sure it means the police have to work harder to develop probable cause--but hey, that is a good thing. The down side is that the erosion of Fourth Amendment protections will become so complete that ultimately our personal freedoms will be just a memory of what past generations used to have. We must protect our rights and freedoms and be aware of the forces in our society and government which seem to want to protect us from ourselves. 1. The neatest T-shirt phrase I've seen in a while: "Careful or you'll end up in my novel." 2. I walked about 122,846 steps in 8 days (according to Chris's pedometer). At 2200 steps to the mile, that is almost 56 miles in 8 days. 3. Disney employs 65,000 people--and they all smile (mostly). 4. I think Makayla was upset at me when I got home after my vacation--she walked by me and straight to Patrick. I felt very unloved. 5. Yesterday there were four teams tied for the MLB AL East lead; today only two and the Orioles are one of them! The Yankees aren't. 6. 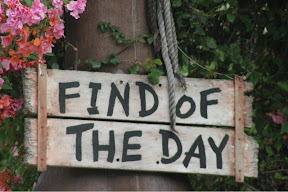 I saw the sign "Find of the Day," and thought it was good advice. Find something new, unique, or memorable about every day. 7. I am very dependent upon a good internet connection. "There's no place like home," so the line from the Wizard of Oz goes as Dorothy is reunited with her family after her adventure. I, like Dorothy feel much the same--even though I traveled with some of my family--it still feels good to return home with hundreds of photos and many memories of the past 8 days. It was a long vacation--but it still passed too quickly as all vacations seem to do. It would be grand if I could stay on vacation and not return--but then I would miss the small whines that Makayla makes as she sits next to me in the morning reminding me that the last corner of the toast is hers. And then too, I would miss pool opening Saturday--which, coincidently is Saturday! And I would miss so many other things in my life that are as I have made them o allowed them to be. The great thing about getting away is returning to rediscover how much I missed the routine and seemingly mundane things in my life. Ii is a rediscover because I seem to appreciate being home more after each trip I make--even to places so close to my vision of paradise. It will take me the rest of the week to catch up. But the time away was worth it. And so was all of the planning that made the trip a huge success--thank you to Nicole and Chris, you pulled it off! OK--shake off the cob webs and get back to work! Day 7 was a day to relax by the pool and enjoy the warmth of the sun of Florida. It was made all the better by reading the reports of cod and snow in the north. I may have gotten a sunburn. Yay! I know that is almost heresy, but I did sit in the sun for a couple of hours. I sat by the hot tub and enjoyed the bright blue sky and the sun bathing the pool area with its warmth. It was awesome for the next to last day of a long trip. Dinner at the Grand Floridian was awesome--what a resort. I want to stay there next time. 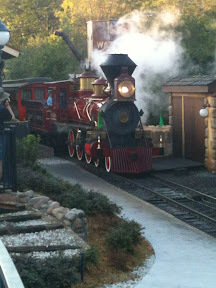 During our time in the evening, I had the chance to watch the Disney Train depart a station.It was interesting to watch the steam engine prepare to depart. And nostalgic. We closed out the day at the Magic Kingdom. 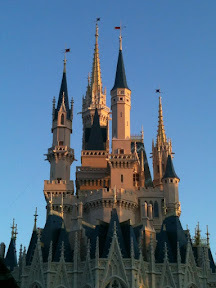 The sky was clear blue and the setting sun made the castle seem as magical as some think it is. Our return to the Magic Kingdom was mostly devoted to exploring and becoming reacquainted with Tomorrowland. Tomorrowland remains a 1970's vision of life in the future. It has become tarnished and is in need of a total make over. The marquee ride remains Space Mountain--which while nostalgic, is a far cry from the spectacular roller coasters deployed in the 40 years since it first hit the rails. I first visited Tomorrowland during 1973, two years after the park opened, and it was a magical place expanding the mind and thoughts of the future. Now, it is dated and old. Gone is Alien Encounter replaced by Stitch's Great Escape--no difference just a different character. I note, as we walked around the larger Magic Kingdom, that Fantasyland is under going a major reconstruction. I only hope that Tomorrowland is next. It took an eternity to get from our resort to the place we had reserved for dinner. One leg, on a Disney bus, was done amid the most noise of screaming children and adults talking I've the screams that I have ever experienced in my life. It was awful. And the the arrival announcement came on and added to the din. I have been near jet engines which were quieter. It is better now though. We are waiting for dinner and enjoying some evening libations. It could be worse, it could be better but it isn't. 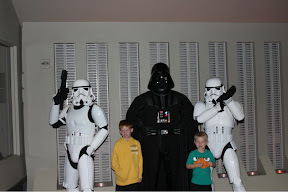 One of the highlights of the day was meeting Darth Vader along with two Storm Troopers. That happened because of the thunderstorms. The best fun of the day was at Toy Story Arcade. Hollywood Studios has really improved since my last visit. The Tower of Terror, which I did twice, is really pretty lame. The Rock 'n Rollercoaster is exciting and fun, but too short. I have to confess, this park is not a visually stimulating as Universal Studios, but it is fun nonetheless. Where else can I stand in the middle of one street and take a picture of San Francisco AND turn 90 degrees and take a shot of NYC? The restaurant we ate lunch in was probably the best of the trip--it was Italian fare. Note to all who like wine--I mean decent wine. There isn't any in Disney. Ugh! The wine is mediocre at best and the selection is very pedestrian. They need to stop buying in bulk and begin to specialize in better wines. 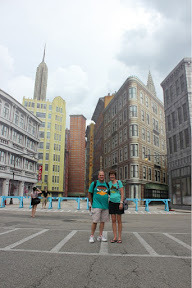 Universal Studios Islands of Adventure was the day 3 destination. 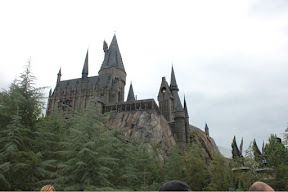 Can you imagine the crush of people who want to visit Hogwarts and the Harry Potter section of the park? Why? And I am not a huge Harry Potter fan, but this section of the park makes the books come to life in a believable way. The place is magical as are the other sections of the park which include Jurassic Park, Super Hero's Island, Dr. Seuss, and Sunday Comics Land. 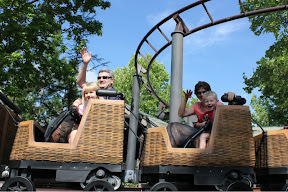 This day was devoted to adventure and riding rides. Chris and I rode one roller coaster four times during the first hour while watching Jax during the period when the rest of the party was off doing the marquee ride in the Harry Potter section. 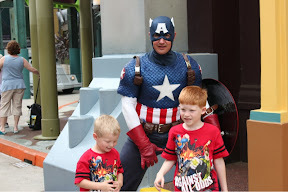 We also had a great meeting with Captain America! Who was very engaging. I personally think he was happy to meet some boys who at least spoke English. There were a lot of languages being spoken at the park--not English. I did get to experience three different wide where the signs said something like: "You may get wet." I can assure you, the signs understated the probability. 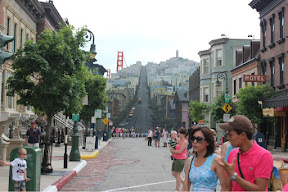 Indeed, the ride designers apparently took the opportunity to ensure that those who dared to pass the signs got soaked. 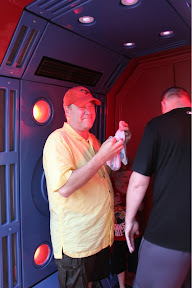 I also got to experience a "people dryer." And it felt good on a cool day. It was a busy day. A fun day. A wet day, A day devoted to fancy and imagination. From the Character Breakfast at 7 AM in the Contemporary Hotel, to the welcome performance in front of the train station entrance to Main Street USA, to the 10 PM fireworks to close out the day, in the words of someone: "we did it all," well mostly. The boys were fried by the end of it all even though we did return to the resort for a middle of the day respite (read nap). But we also experienced a very active pool area as well. 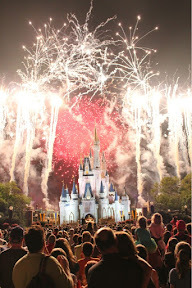 My take on the day--the Disney magic is beginning to fray around the edges. We had trouble with out lunch reservations and then our dinner reservations and saw behind the Disney magic a bit to the side where people are over worked and not really happy to help. We also decided that the busses do not run frequently enough from our resort, although we did get out of the park at the end of the day in fairly efficient fashion. That written, the Fast Pass system works well. Having a plan for the day works great too. Nicole's plan to start the day saw us on five attractions within two hours. Fabulous. 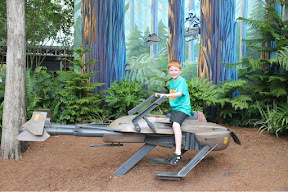 Well, almost, running at full tilt at 9 AM to get on an attraction is a bit excessive--but it worked. 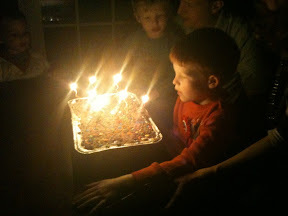 The boys were great--mostly. But of course the heat and constant activity took its toll. 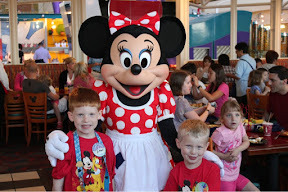 At the airport on the way to Orlando and a week of fun with Mickey! 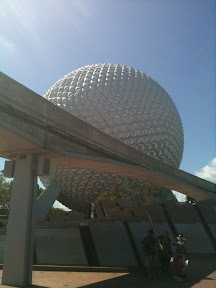 Epcot today to get started. 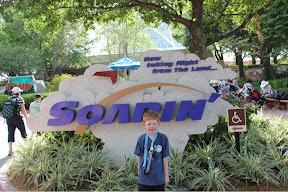 Soaring is on the agenda. But first to survive BWI and get to the land that the mouse built. Our party of 7 will never be the same. Five adults and two children but all young at heart. By 8:30 AM, the semiannual clipping of Louis had been completed yesterday. Louis is a 14 pound rag-doll cat with very long fur which matts pretty badly, especially during the summer. In an effort to keep him more comfortable we have him clipped. 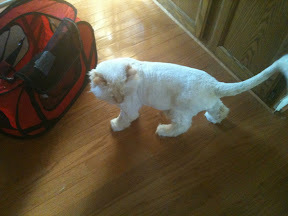 This is the after picture and he is sporting what is called the "lion cut." I know it seems pretty radical, but I believe he really appreciates the short cut. There is a bit of self preservation involved as well--the hair ball count goes down dramatically after he gets trimmed. Every cat owner knows that there is nothing worse than getting up in the morning and stepping into a cold and slimy fur ball with their bare foot. The process to trim Louis is not without some danger though. He does not tolerate it too well and must be drugged. Even so, it is two person process and I caught a claw helping the groomer shave the cat. Apparently, Riordin was unhappy that he did not get invited out for the trip. 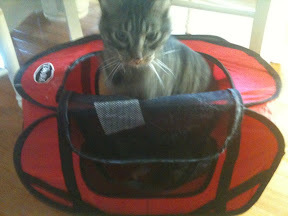 He checked out the carrier after we returned home. Little did he know where that carrier had taken his best friend. Louis recovered nicely from the drugs--they barely affected him anyway--just taking the edge off a bit, and the day went on. Another checklist completed on the highway to summertime! I spent a day as a volunteer Dad at Ethan's school on Friday. I was part of a program they call Watch D.O.G.S.. Who knew that I was a hero of the hallways. I learned a lot about education in America today as I saw first hand the over crowded and dirty classrooms that are part to public education. That learning can occur is really a testament to the dedicated teachers who struggle in these less than ideal conditions. I noticed a few things during the day that show how much life has changed since I was in elementary school not just a few decades ago. Lunch boxes have really changed. I remember metal lunch boxes in the shape of school busses or with the some Disney characters on them. The boxes are now canvass and probably work a lot better. They are adorned with current heroes and movies. The most popular among the boys is Clone Wars--I saw five boys sitting together all with Clone Wars lunch boxes. The noise is deafening. Everywhere it seems the noise is at levels equal to that of jet engines. Security is serious. One of my jobs was to ensure every door in the school was locked. I was amazed how many outside doors there are in a school. And I found an insecure door which I immediately secured. I found the pace of the day slow--and that is not bad. I was able to stroll outside in the sun for a couple of hours during the beautiful day--something that I never would have been able to do at my regular job. So yeah, I enjoyed it. As a trained Watch D.O.G.S., I expect to volunteer again. It was nice to get to know the administration and the teachers at the school. 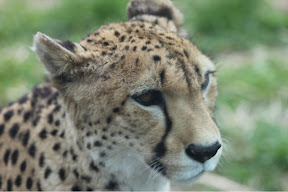 Although I did not get to go to the zoo last week, Chris did, twice, and took some great images of the animals who live at the Baltimore Zoo. 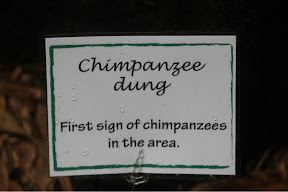 The zoo is really very nice, but a bit off the beaten path. 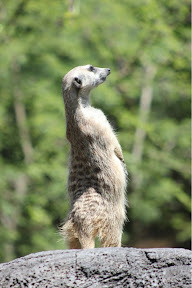 The animals were very active; providing the opportunity for some great shots. I was reminded of an old Paul Simon song about the New York Zoo from her stories about the activity of the animals and spectators. She was most proud of her images of the bats taken from within the darkness of the bat room. 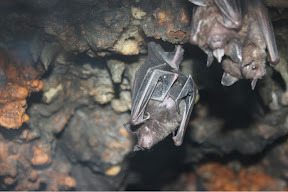 I can see why--close up and personal with the bats. OK--maybe that part is kinda creepy. The forest that I wrote about a couple of weeks ago in the article Forest's Final Spring has ceased to exist. A broken 10 acre plot of ground, devoid of life and trees, now sits where the thriving woodland community formerly stood. It is sad and permanent. I have watched the trees be removed during the past two weeks as the plot was cleared. The heavy equipment was ruthless--no living thing remained standing. It was like a scene from Fern Gully or Avatar. What is even sadder was the realization that in a month or so, the new empty space will seem normal to me. I won't remember the trees and the life which abounded there in advance of the construction project now underway. 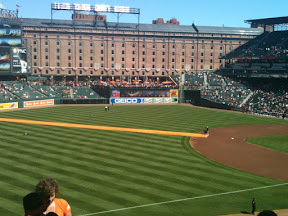 I went to see the Orioles play last evening. I was hoping to see them win again. I learned that watching a summertime sport as temperatures approach the mid-40's is not a lot of fun. Frankly, I was freezing and wishing with every pitch for summertime and 80 degrees. I thought I had dressed for the game--two shirts and a coat. But it was so cold, I didn't even want to finish my beer--because it was making me colder with every sip. The only thing keeping me there was that the Orioles were winning. When the lead evaporated during the sixth inning and the game was dragging, I began to think about turning the heater on in my truck and warming up. So I left--purely for self-preservation. On the drive home, I finally warmed up. I bet it was over 90 degrees in my truck when I pulled into the driveway of my home. If I had known it was going to be a winter game,I would have dressed even warmer. As it was the Orioles lost in 12 innings. So I probably made a mature decision. At least I got warm again. I hopped into my truck yesterday morning, after the weekend, ready to drive off for a 5:30 AM racquetball match and start the week with some activity. I was shocked when I looked at the fuel indicator and it read: "E." "E" as we all know does not stand for "enough!" Empty, I didn't recall leaving the truck with no gas the last time I drove it. And I was running late as I had spent an extra minute or so with Makayla. Unfortunately, the gas station is out of the way when I am running behind. Thankfully, I have other vehicles to choose from, so I moved all of my stuff--no small task when considering my overstuffed racquetball bag to one of my other waiting steads. There was no way I could risk heading out as I had three stops to make and tight timelines to keep. As I drove out of the drive, I realized it would be 14 hours until I returned. Ad no time for a trip to the gas station to get gored by the unreasonably high prices there. Why, I pondered was the truck empty? I did not see or smell a leak. 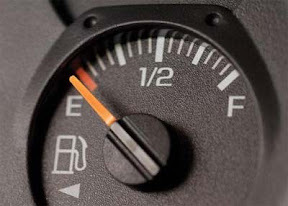 I don't leave my vehicles on empty because I hate getting gas on my way to anywhere. I much prefer filling up at the end of trips. I had loaned my truck out. And my generosity was rewarded with an empty gas tank and inconvenience. I admit, there was probably only a quarter of a tank in the truck anyway--and it wasn't that the gas wasn't replaced that really bothered me--it was that it was returned empty and no one told me. Empty is really a slap. Yesterday was busy enough that the truck is still empty, so I have to leave earlier today to refill the tank and get over it. But it still bugs me--just a bit. 1. Have you filed your taxes yet? I prepared them but haven't sent them yet. Oops! No refund for me! 2. Easter allows us to live like, "Don't worry, be Happy!" 3. I just recently realized that autumn is springtime in reverse. In the spring the trees start with bare branches, then don many colors and finally turn green. During the autumn, they start out green and wind up robed in many colors before returning to bare branches until springtime comes round again. 4. Blue skies, sunny days, singing birds, and budding flowers--nice! 5. In the deepest darkest depths of despair, hope lives. 6. The hardest thing that I do is to ask for help. I seem to need more help now than ever before. And the funny thing is, people don't mind helping, they just need to be invited. 7. Five bottles of wine--equals Easter dinner for the family. 8. Nerf wars in the house and yard are great for burning off the excess energy associated with holiday activities. I woke up before dawn, or more precisely as dawn was just beginning to break on this Easter morning. 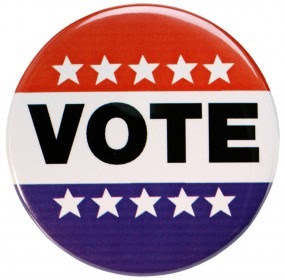 I read an article yesterday about how the young people in America are becoming disenfranchised with Christianity. Andrew Sullivan made the following observation: "Appearing on "CBS This Morning: Saturday," Sullivan said the crisis facing Christianity was especially bad today for one reason: "When I go and see young people, their image of Christianity these days is one of judgment, intolerance and to some extent bigotry and politics," Sullivan said. "They associate it with one political party in this country, because of the fusion of evangelical and ultra-orthodox Catholics with the Republican Party. They don't see it as the message of Jesus, they don't see it any more as a message of love and forgiveness. They see it as a bunch of people trying to control their lives through political mechanisms." I see this. I had a conversation with a younger adult the other day that was precisely about this. The message if Easter has become lost and strangled in political strife and religious wars across the globe. 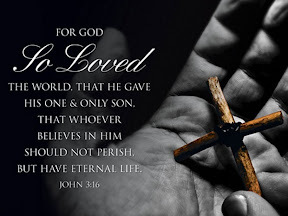 The whole idea of Christians greeting each other in love and with the excited statement of so long ago: Christ is risen, He is risen indeed, has become muted and lost as Christ followers try to remake the world. Maybe we have lost our vision. We almost certainly have lost sight of His vision. Has Christ's message become confused with our own desires? As we are trying to reshape the world have we substituted our vision for that of Jesus'? Jesus loved sinners and gave them hope. We should know--we are sinners too. We need to love sinners, too. I am reminded, on this dawning Easter morning as I replay the events of the first Easter in my head, of the empty tomb, the confusion, the despair, the fear that those who were gathered felt as the miracle began to become clearer to them. As your Easter dawns today amid the celebration of family and friends or whatever form your remembrance of this greatest day in the history of God's relationship with man takes, pause to think about how we are being perceived by those we are most desperately trying to reach. Are we inviting and forgiving, or are we hard and judging by trying to push a political agenda onto people who don't understand it? It was truly a holiday--and the crowds were crushing. I haven't see so many people at Camden Yards in a long time. 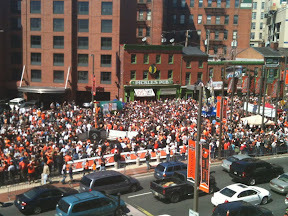 It was impossible to move at the pre-game party across the street from the stadium. And as it was, that party continued throughout the entire game. I had been in that crowd only minutes before but decided it wasn't a lot of fun and headed off to the stadium to find my seat for the game. The day was cool--especially in the shade. The sky was clear. 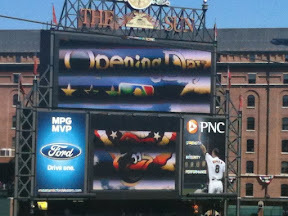 It was Opening Day for the Orioles and expectations for the 2012 campaign were high. The stadium was ready to begin the 20th Anniversary celebration. And it did not disappoint. Neither did the Orioles. The game was a gem, with the starting pitcher, Jake Arrieta, going seven innings and giving up two hits and no runs. The relief corps didn't do so well, but the O's still chalked up a win on opening day. With one game down and 161 to go, they are tied for first in the American League East. As Patrick and I were chatting in our seats, we were trying to determine how many Opening Days I have attended--and I believe it is 10. I had thought they were 10 straight, but I did miss one year when we went to Napa for Spring Break. I guess that was a good trade. Baseball is back! Next up, the pool! Today, summer begins, not officially but in spirit. 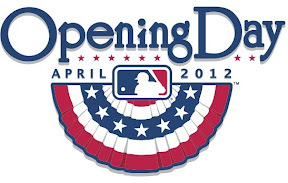 It is opening day for the Orioles. Arguably, ok probably not, the 30th best team in baseball. But they are my home team. And they play the Yankees, a lot. And the Blue Jays, too much! The Orioles are my home team and I will continue to root for them as I remember the glory days of the 60's, the 70's and the 80's when they were the best team in all of baseball. I expect to be at the game later today--which coincidently is Good Friday. The game is a sell out--I haven't been to one of those since last year's opening day. At least there is no way that I could ever be considered a fair weather fan. I have supported this team through 14 losing seasons--always looking for the silver lining in the dark storm cloud of reality. I have not found it yet, except for the realization that there is always tomorrow and that baseball is a sport--a game, and not a life or death proposition. I can enjoy a game even when we are losing because it is baseball. I love baseball. The park, the fans, the game, the snacks, the beer. The annual event in our yard is underway. 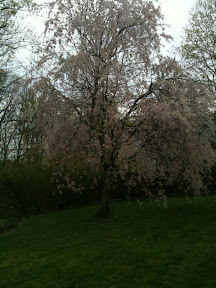 The weeping cherry is in full bloom gracing our lawn with blooms like waterfalls. It is sad how quickly the blooms pass and the tree becomes green, but for a about two short weeks it is absolutely beautiful. It is a sight to behold and to ponder the beauty of the springtime. The tree provides beauty as it transitions from the dormant branches of winter into the green leaves of summer. 1. Happy April showers designed to bring May flowers. 2. 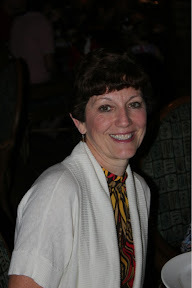 I was definitely spoiled by the warm temperatures from a couple weeks go and my trip to Florida--bring on the heat. 3. I was home alone yesterday afternoon and I discovered what Makayla likes to do on nice quiet days. Sleep. 4. Yard work, in small doses, is therapeutic. 6. The O's and the Pens both managed to lose yesterday. Ugh. One is trying to end the season on a high and the other is trying to begin the season and not be the doormat of MLB. 7. There was an announcement of the TV the other day reminding gardeners that the only safe plant to begin planting are pansies. Don't waste you money, I was reminded. 8. An interesting situation occurred the other evening. Presented with two very different wines, a good one and a not so good one, I found that tasting them side-by-side made the good one seem better and the other even less appealing. 9. I have been reading Aesop's Fables, off and on, as time permits. I highly recommend getting in touch with these short proverbs about life. 10. Welcome to Holy Week. I read a book last year that provided convincing evidence and analysis that the Last Supper occurred on Wednesday, April 1, AD 33. The book is The Mysteries of the Last Supper, by Colin J. Humphreys. A small 10 acre forest near where I live is coming to life this springtime. The trees are filling out with new leaves and displaying stunning colors of reds and oranges which soon will become green, beautiful leaves. 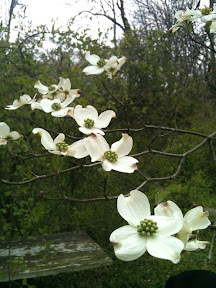 As I look into the woods, I see the dogwoods in bloom--with their flowers bringing joy to my heart while brightening up the the still coming to life forest. Alas, though, this is the final springtime for this small wooded area. The county has decided to raze the forest and build an elementary school. The work will likely begin before the May flowers bloom. I drive by this small wilderness, strategically placed in the middle of suburbia, every day. I never realized how much this small patch of trees and wild kept me in touch with my roots until the day I realized it would soon be gone. How sad--trees and brush teaming with wildlife soon to be replaced by brick, mortar, and mowed grass. So I have been especially noticing the beauty of the trees this springtime as they burst forth in life, before the chain saws and heavy equipment arrive to forever change this small plot into a something tame and sterile. I mourn the loss and I hope that I will not soon forget the vision of this small forest and the trees and life which it contained.